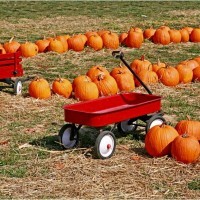 Home » Fitness » Learning is Fun at a Pumpkin Patch! Visit a pumpkin patch. It’s is a great way to get kids engaged in the process of farming and growing vegetables. They can see firsthand how the crops are grown, and select a pumpkin to bring home. Remind them that it’s a vegetable they can eat! Take a walking tour of the farm or walk all the way around the pumpkin patch before selecting the pumpkins. Many patches also have farm fresh produce or roasted corn to enjoy. Take advantage of these teachable moments: see if the farmer is around to talk to! Continue the teaching at home by making pumpkin pancakes together –kids can learn fractions, following directions and much more when cooking in the kitchen. Just remind yourself to be patient if you’re just beginning to cook with the kids. Comment on Learning is Fun at a Pumpkin Patch!